We've included these beaches for you: Ponquogue Beach and Fire Island National Seashore. Head to Fifth Avenue and SoHofor some retail therapy. Step out of New York City to go to Wantagh and see Jones Beach State Park, which is approximately 50 minutes away. There's lots more to do: explore and take pictures at Central Park, look for gifts at Tiffany & Co., take in panoramic vistas at Top of the Rock, and explore the world behind art at The Metropolitan Museum of Art. To see ratings, traveler tips, reviews, and more tourist information, refer to the New York City trip itinerary planner. London, UK to New York City is an approximately 11.5-hour flight. You can also do a combination of flight and bus; or do a combination of flight and train. The time zone difference moving from Greenwich Mean Time to Eastern Standard Time is minus 5 hours. In November, daily temperatures in New York City can reach 16°C, while at night they dip to 7°C. Cap off your sightseeing on the 21st (Wed) early enough to travel to Houston. On the 22nd (Thu), enjoy the sand and surf at Sylvan Beach Park and then buy something for everyone on your list at LaCenterra at Cinco Ranch. Get ready for a full day of sightseeing on the next day: shop like a local with Memorial City Mall, put a fun spin on your tour with Quest Shark Adventures, then stop by Pearland Town Center, and finally stroll through Hermann Park. For where to stay, traveler tips, photos, and tourist information, use the Houston tour itinerary planner. Fly from New York City to Houston in 7 hours. Alternatively, you can do a combination of bus and flight; or drive. Due to the time zone difference, you'll gain 1 hour traveling from New York City to Houston. Expect somewhat warmer temperatures when traveling from New York City in November; daily highs in Houston reach 26°C and lows reach 15°C. Finish your sightseeing early on the 23rd (Fri) so you can travel to Las Vegas. Head to The Strip and The Grand Canal Shoppes at The Venetianfor some retail therapy. And it doesn't end there: ponder the design of Bellagio Fountains, look for gifts at Barneys New York, try your luck at Bellagio Hotel and Casino, and explore the striking landscape of Red Rock Canyon National Conservation Area. For reviews, photos, and other tourist information, you can read our Las Vegas vacation planner. Traveling by flight from Houston to Las Vegas takes 6 hours. Alternatively, you can do a combination of bus and flight; or drive. Traveling from Houston to Las Vegas, you'll gain 2 hours due to the time zone difference. Traveling from Houston in November, things will get a bit cooler in Las Vegas: highs are around 23°C and lows about 9°C. Wrap up your sightseeing on the 28th (Wed) early enough to travel to Seattle. Give yourself a bit of retail therapy at Pike Place Market and Pacific Place. 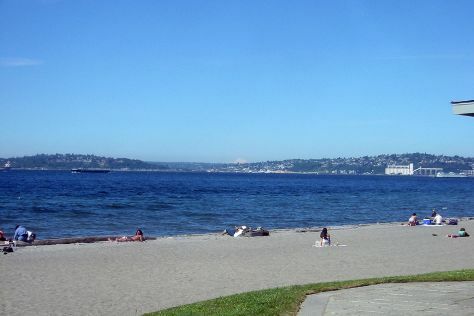 Your itinerary includes some good beach time at Alki Beach and Seahurst Beach Park. Change things up with a short trip to Picnic Point Park in Edmonds (about 54 minutes away). And it doesn't end there: kick back and relax at Golden Gardens Park, examine the collection at The Museum of Flight, stop by Elliott Bay Book Company, and tour the pleasant surroundings at Woodland Park Zoo. For reviews, more things to do, ratings, and other tourist information, go to the Seattle visit planner . Traveling by flight from Las Vegas to Seattle takes 5 hours. Alternatively, you can drive; or take a bus. In November, Seattle is a bit cooler than Las Vegas - with highs of 13°C and lows of 6°C. Finish your sightseeing early on the 3rd (Mon) so you can travel to Homer. Homer is a city located in Kenai Peninsula Borough in the U.S. Kick off your visit on the 4th (Tue): cast your line with a fishing tour, then grab your bike and head to Homer Spit, then get answers to all your questions at Alaska Islands and Ocean Visitor Center, and finally admire the masterpieces at Bunnell Street Arts Center. To find where to stay, other places to visit, traveler tips, and more tourist information, you can read our Homer trip planner . You can fly from Seattle to Homer in 7.5 hours. Other options are to do a combination of flight, taxi, and bus; or drive. The time zone changes from Pacific Standard Time to Alaska Standard Time, which is usually a -1 hour difference. Plan for slightly colder temperatures traveling from Seattle in December, with highs in Homer at 1°C and lows at -4°C. Wrap up your sightseeing on the 4th (Tue) early enough to travel back home.